The Net Promoter Score – why is it important and how to calculate it? How many times have you seen this question? One way or another it is very commonly asked after you buy something or use a service. Well, no wonder, it is the Ultimate Question. The Ultimate Question is a book written by Fred Reichheld, it explains the science behind the approach called the Net Promoter System. In a few words, it’s a scientifically proven method to measure customers’ satisfaction. You can measure pretty much anything: how good is your product, how well is your service performing and even how loyal your customers are and if they will come back to you in the future. It is THE question and is a very handy metric if you are curious to know the answers. 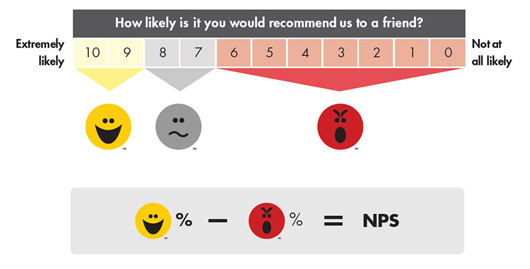 We’ve been using the Net Promoters Score (or NPS) metric for a couple of years here at Mindvalley. We found that it’s a very effective yet simple way to get and measure our customers’ feedback and satisfaction with our products. the negatively minded/angry customers who not only will complain, but they also will tell their friends to never trust your company. The NPS system calls these groups promoters, neutrals and detractors. Your goal, ultimately, as a successful business, is to have more promoters than detractors. Input the absolute number of responses for each value into this spreadsheet. Compare your NPS between months, promotions or products. Negative Values will identify the products you need to work on the most. Enter the number responses received for each Value from 0-10. Do not leave blank cells on the Absolute Row – just enter 0 if you did not receive responses for that specific value. You can enter the results of up to 4 survey on this Sheet. You can always visit the NPS site for more info: www.netpromotersystem.com. After doing this simple exercise , you will know if your products create more detractors than promoters. The ones with big negative scores are to be addressed – they might be hurting your business in the long run even if they generate a lot of profit. You can expand this concept in many ways but this method is the best and easiest way we found to test our products. We use this exact same process here at Mindvalley. We make sure that we start fixing the products with negative scores by addressing the issues brought up in the comments section of the survey. It’s a really straight forward way to prioritise your work on enhancing your products. Please comment below and share how you use the Net Promoter Score or other important metrics in your business to help you make important decisions. Next post How we built the #1 Highest Grossing Health and Fitness App in 30+ Countries. How do you get the correct figure for the end column on the spreadsheet? It currently has a percentage sign which is wrong, it needs to be a figure from -100 to +100. If I change the format, it just goes to a decimal figure… Thank you. Great article, very clever system, love it, is in my tool box, thank you so much.